Ethel Alice Ausink was born on November 27, 1917 in Sioux Center, Iowa to Wilhelmina and John Hoekstra. 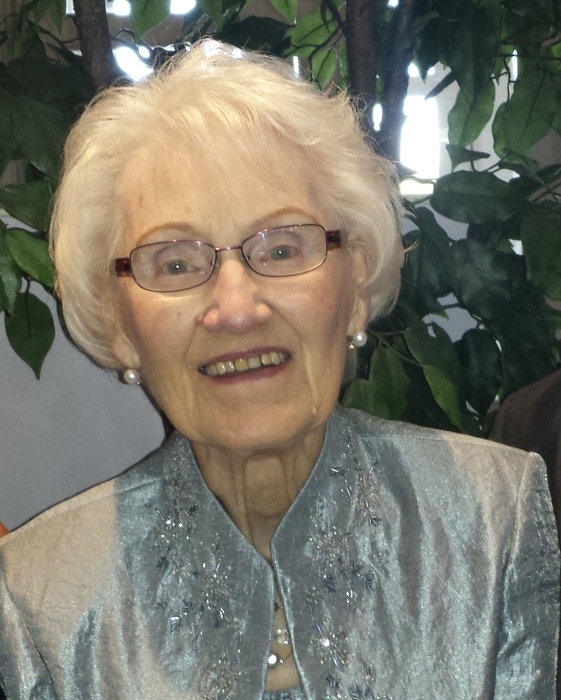 She went to her Heavenly Home on April 1, 2019 at the age of 101, where she was greeted by her parents, her husband Albert, two brothers (Robert and LeRoy), son-in-law Jerry Fast, and many friends. She leaves behind her 5 children: Bob (Cris) Ausink, Hampton, VA; Corlea (Pete) Boyer, Excelsior, MN; Marianne (Jon) Westlake, Detroit Lakes, MN; Joanne (Dan) Tims, Austin, TX; Rebecca (Mark) Segner, Waconia, MN; her 11 grandchildren: Bruce (Helena) Ausink, Bryan (Jessica) Ausink, Brent Ausink, Bradley Ausink, Kristina (Ryan) Heck, Peter Boyer, Jr, Angela Tims, Matthew (Katie) Tims, Ryan (Allison) Tims, Rianna (Kevin) Lenzen, Shane Segner; and 9 Great-Grandchildren. Ethel grew up on a farm outside Maurice, Iowa and graduated from Northwestern College in Orange City, Iowa. After teaching in a few country schools in Iowa, she went on an adventure to Bellingham, WA to begin a new teaching job. There she met Albert Ausink, and they were married in 1945 in Matlock, Iowa. After living in Mt Vernon, WA for 4 years they bought a farm outside Slayton, MN where they raised their 5 children. During those busy years Ethel used her gifts of music and teaching to serve her community and church (Slayton First Reformed Church). She played piano and organ, conducted the choir and musical programs, taught piano to many students, led 4-H, and taught children’s Bible classes and adult Bible studies. Later she returned to teaching at various local schools, finishing at the Slayton Elementary School where she retired in 1983. Her husband Albert died suddenly from a heart attack in 1985 and in 1988 Ethel moved to Victoria, MN to be closer to most of her children and grandchildren. There she continued a busy life of service, not only to her family, but to her community. Continuing her musical pursuits, she played the piano actively in church until the age of 98. She was also a member of the Chan-o-lairs Choir in Victoria, served on the Seniors’ Advisory Board, and wrote a column for the Victoria Gazette for 18 years. She fulfilled her passion for travel by visiting 47 states and 15 countries. In 2001, she moved to a smaller home in Excelsior, MN and continued her passions of music, quilting, reading and travel. While her accomplishments were many, it was her faith and service to her Lord and love for her family that was most important to her. She leaves a rich legacy of faith, joy in living life to the fullest, and unconditional love for her many friends and family. Visitation will be on Tuesday, April 16, 2019 at the Totzke Funeral Home in Slayton from 12:00 to 1:00 p.m. with a graveside service to follow at Slayton Memorial Garden in Slayton, MN.